New Harbinger Publications, 9781572243286, 185pp. Kimberlee Roth is a health writer and journalist. 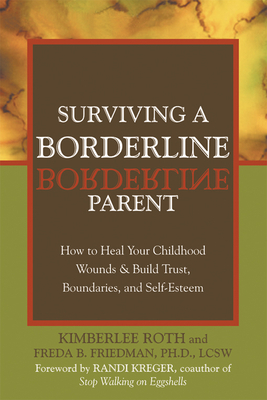 She has written about Borderline Personality Disorder and topics related to physical and emotional well being for numerous newspapers and magazines, including the Chicago Tribune. Freda Friedman, Ph.D., LCSW, is in private practice and a member of the Phoenix Institute in Chicago, Illinois. For the past twenty years, her primary clinical focus has been with Borderline Personality Disorder, providing treatment, education, support and consultation to people suffering from the disorder, their families and health care professionals working with them. She is on the board of several professional health care organizations and has developed BPD programs in New York and Chicago.